I feel like this blog post should be attached with some sort of sugary warning. Let’s just say that this one isn’t particularly #LeanIn15 friendly and you won’t be rushing to tell your dentist about it. Although, if you can’t have balance in your life then you’re really not doing it right! Anyway, after a leisurely brunch at Pen & Pencil and baby shopping spree with Ros, we decided to hit our old favourite, Afflecks Palace. We hadn’t step foot in Manchester’s iconic and alternative shopping complex in years, so we were overdue a bit of window shopping. They have Big Fat Gypsy Wedding style dresses and a shop dedicated to condoms, so what’s not to love? Nestled up on the 2nd floor of Afflecks Palace is somewhere even better than we could’ve ever imagined though. 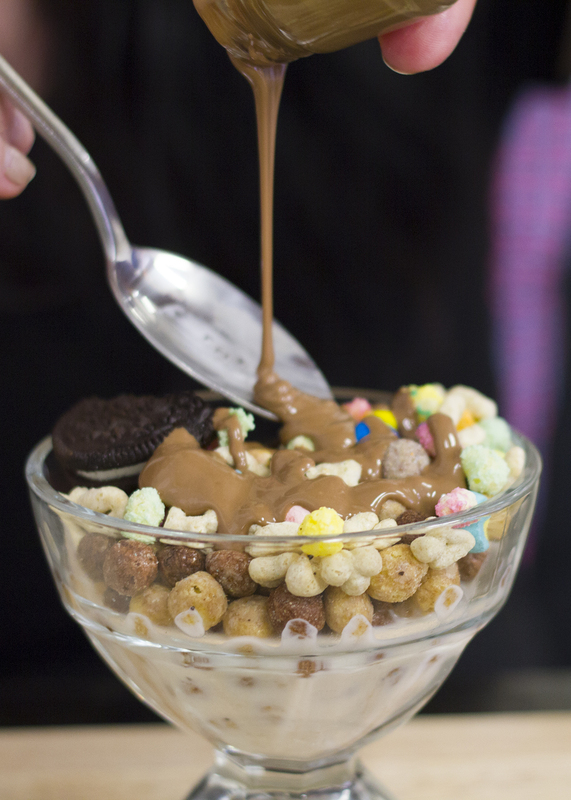 Black Milk Cereal Dive is a sugar tooth gal’s heaven. Ros has been stalking them on Instagram for ages, with their crazy cereal and milkshake concoctions, so we knew we had to pay it a visit. There’s not a savoury item in sight on the menu. For every person who religiously looks at the dessert menu before starters or mains (me), this is the menu of dreams. Beautiful, crazy dreams filled with rainbows and unicorns and cake. Their classic dishes are definitely the cereal bowls, but it’s not just your standard cornflakes here. Think American imports and cereal you just don’t see on the supermarket shelves, combined with flavoured milks and sickly sauces. 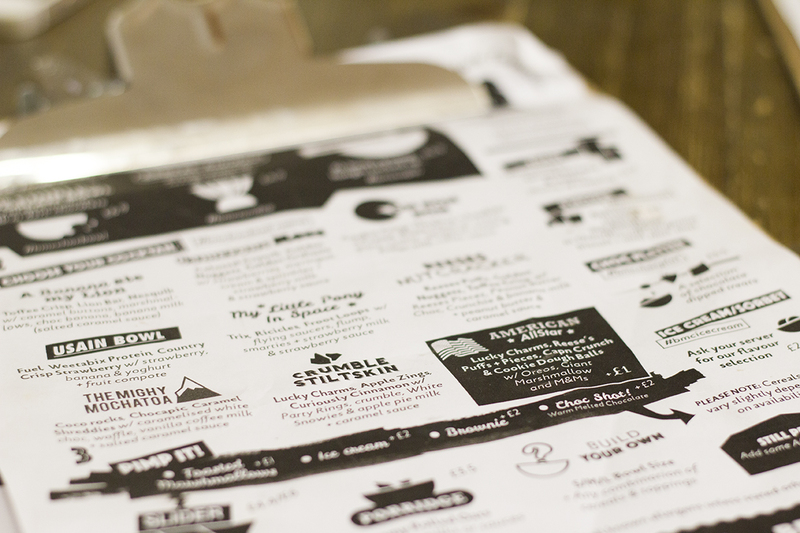 The menu is a bit mad, but you can basically make your own combinations and add whatever you want. When you add melted chocolate and ice cream on to your cereal, you start to think that being an adult ain’t so bad after all. There’s also high rise milkshakes (more on that later! 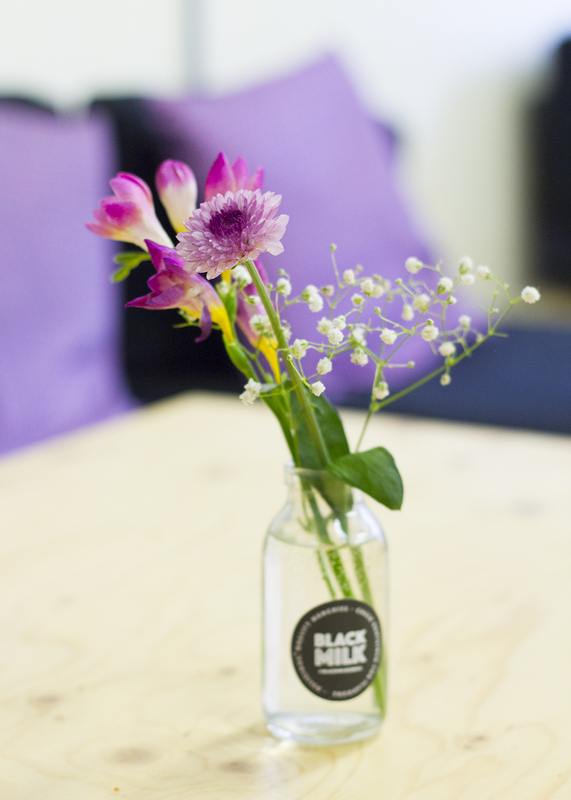 ), homemade desserts like sticky toffee pudding and pimped up hot drinks too. Like I said, they do cereal here but it’s not like the times when you haven’t been food shopping and have to resort to a bowl of sad cornflakes with the last drop of milk. 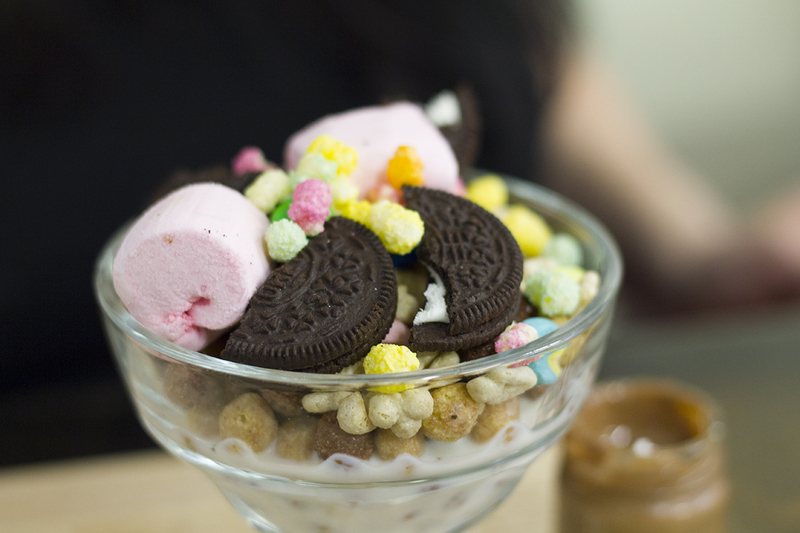 The cereal sundaes are full of the cereal that your parents desperately tried to avoid you eating (aka the best kind). First you choose your bowl, with the standard being a Cereal Sundae and extra options of an edible chocolate bowl or supersize bowl. Then you choose your cocktail of cereal from all of the amazing combos. And lastly you can ‘pimp it’ with extras like brownies, ice cream or melted chocolate. Ros went for the American Allstar Cereal Sundae (£5.90), which was made up of Lucky Charms, Reese’s Puff + Pieces, Capn Crunch & Cookie Dough Balls with Oreos, M&Ms and giant marshmallows to top it all off. Our lovely waiter also decided she *had* to have a Choc Shot (melted chocolate!) on the side too, making himself a new BFF in the process. Cereal has stepped up its game here. 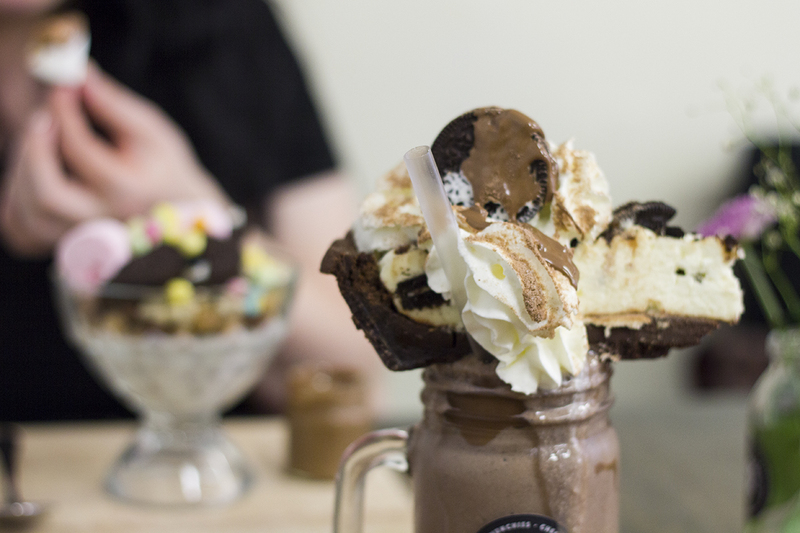 If you came for something insane, the High Rise Shake section is your new BFF on the Black Milk menu. I honestly thought I was being conservative by ordering a milkshake until it was too late and this beautiful monstrosity was plonked onto our table. I went for the Triple Oreo Cheesecake Stack (£7.00), which really isn’t for the fainthearted. 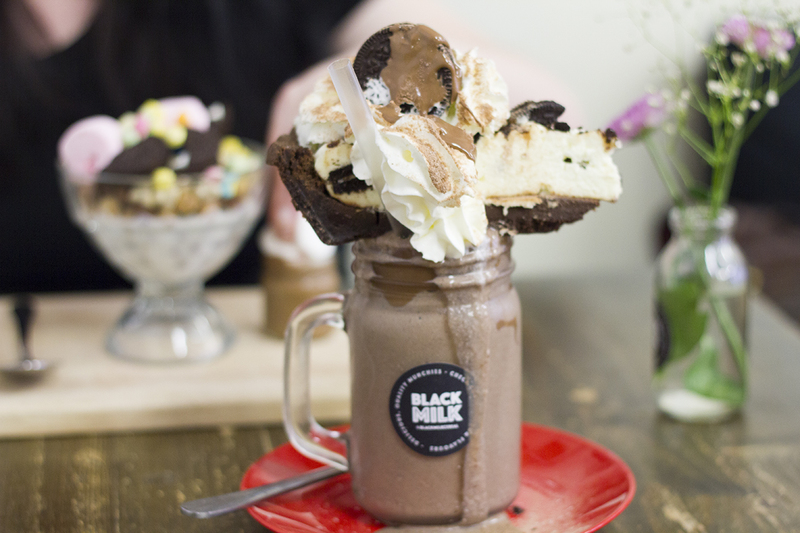 This choc-fest of a signature shake is topped off with a huge slice of Oreo cheesecake. I’m a bit of dessert connoisseur, so when I say this cheesecake was 10/10 amazingly good, you’ve really got to trust me and try it! If the ingredients aren’t enough to make you abandon your sad lunchtime sandwich and run to Afflecks Palace, then you truly don’t belong on this blog post. Base: vanilla butter & Oreo biscuit crush. Filling: Oreo, Milky Way & chocolate milk. High Rise: Oreo cheesecake, Hersey’s chocolate sauce, fresh vanilla cream finish. 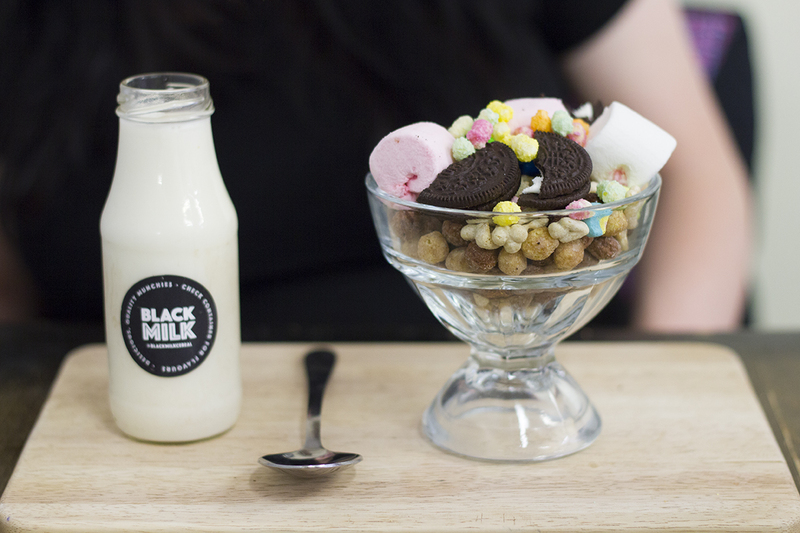 I was one of those people that laughed at the idea of cereal cafes when they first started popping up in London, but I’ve been won over by the guys at Black Milk. The cereal combos are amazing and they also have so much more sugary goodness to offer up to customers, with their High Rise Shakes gaining major popularity. The milkshakes (or freakshakes!) are the best I’ve had in Manchester, even beating Home Sweet Home’s insane Birthday Cake-Shake and the homemade cakes that top them off are amazing in their own right. Even though the cafe itself isn’t much to look at, it has real authenticity and charm. Plus the staff seemed just as excited about their creations as we were. Actually no, we were insanely excited and probably took about 2000 photos. We’re not normal though. 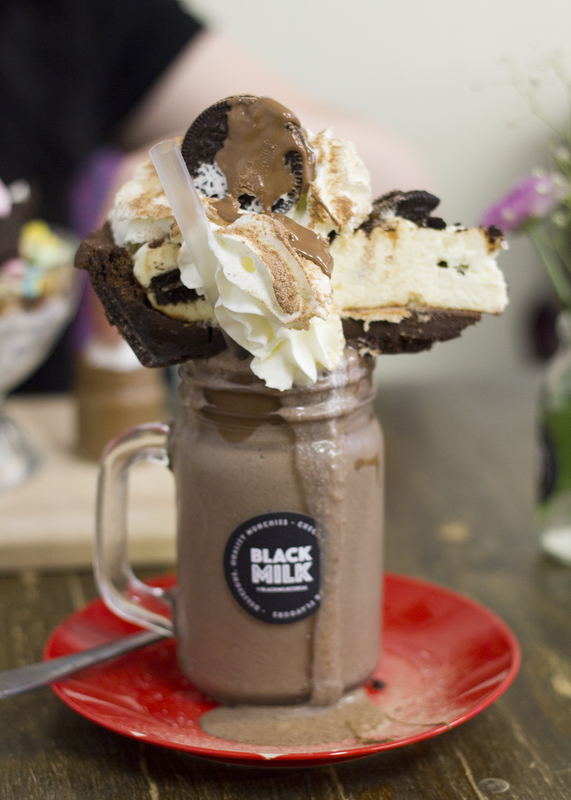 Check out the Black Milk website and menu here, or stalk them on Instagram and regret nothing. 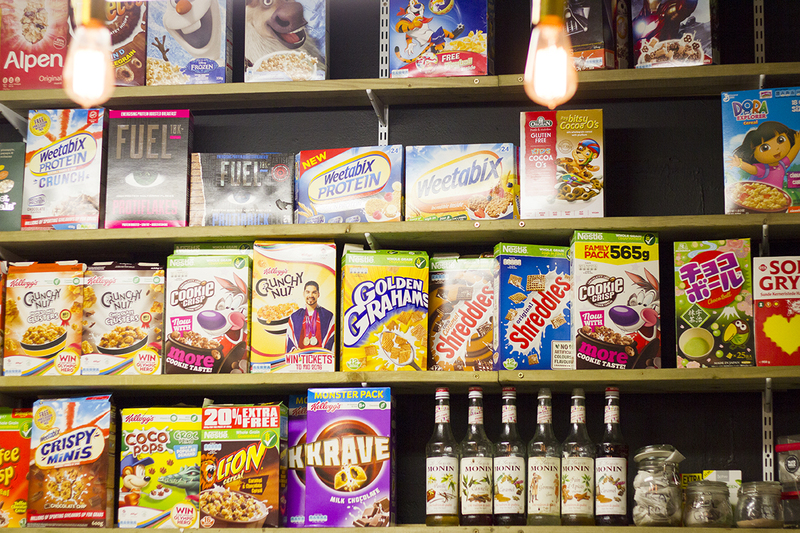 Cereal cafes: love them or hate them? Let me know what you think in the comments below!